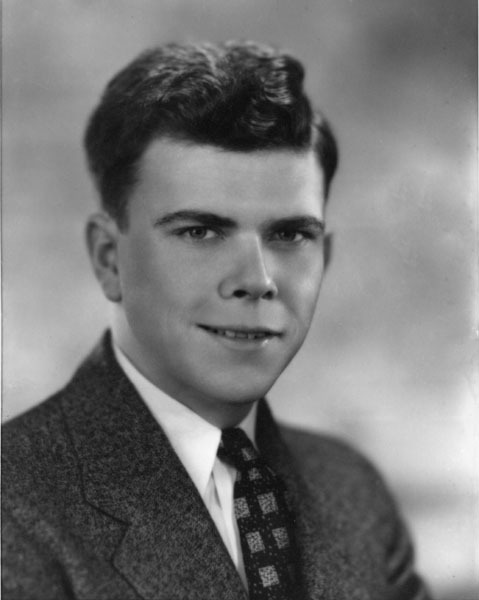 Alec subsequently went to work for the Mutual Life Insurance Company in Ottawa. 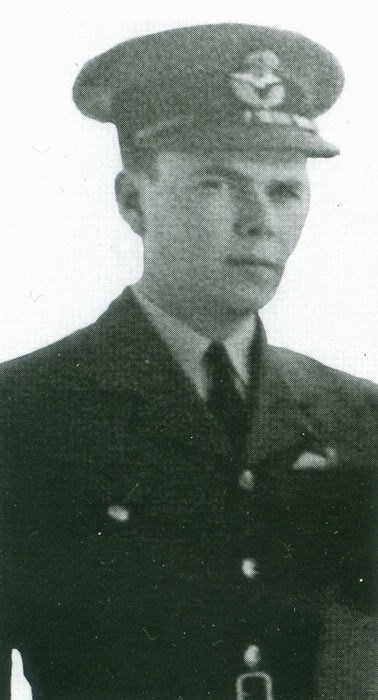 He obtained his Canadian pilot’s licence in Ottawa and joined the RAF on a short service commission in 1938, beginning his ab initio course on 7 March. 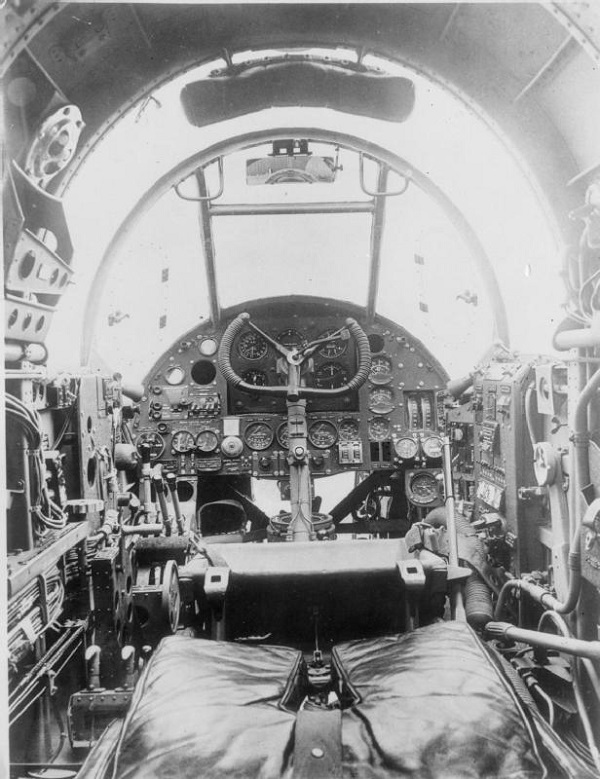 He completed his training at 6 Flying Training School at Netheravon in Wiltshire. He was commissioned as an acting pilot officer on 7 May 1938 and confirmed as a pilot officer on 7 March 1939. Hemswell on 27/05/1940: 144 Squadron Hampden L4135 Coded PL-? The aircraft’s back broke when the pilot turned the aircraft sharply and braked harshly whilst taxiing with full bomb load at 1615hrs. Pilot P/O AAG Trueman and crew were unhurt. 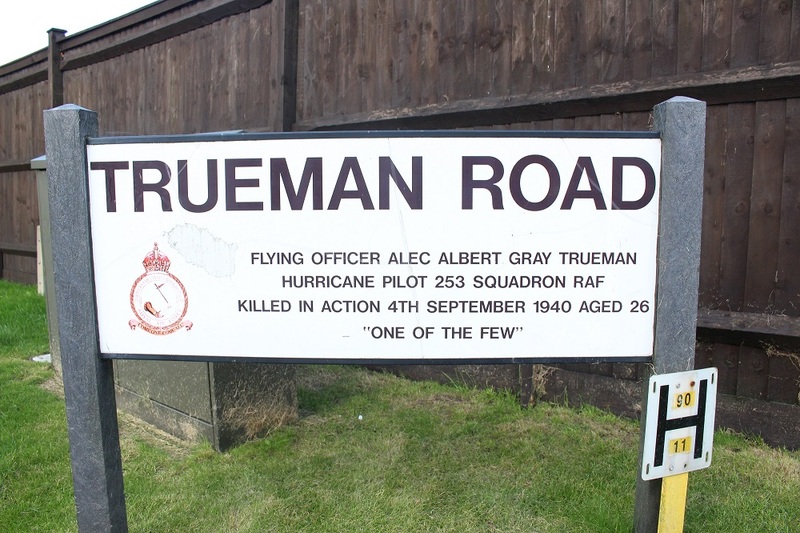 Whatever the reason, Alec arrived at 6 Operational Training Unit, Sutton Bridge in Lincolnshire, on 24 June 1940 to convert onto Hurricanes. On 20 July he was posted to 253 Squadron at Turnhouse, now Edinburgh Airport in Scotland. Earlier in the year, whilst still in Bomber Command, Alec had married a local Lincoln girl, Ethel May Thorburn Lord. In August 1940, 253 Squadron moved back onto the front line of the Battle of Britain and were based at Kenley. On 2 September Alec was credited with damaging a Bf109. Two days later he was in combat over Kenley Airfield when he was shot down and killed by an enemy aircraft, his Hurricane V6638 crashing at Tudor Close, Banstead. 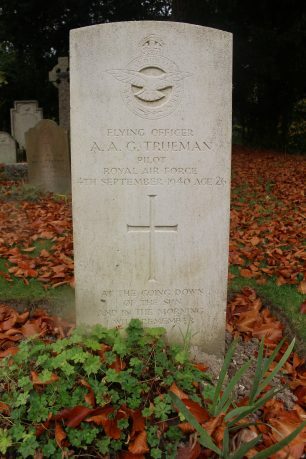 He was 26; the day before his death he had been promoted to the rank of flying officer. In September 1940 a Hurricane fighter returning to Kenley aerodrome crashed in Nork killing the pilot, a 26-year-old Canadian. I happened to see this as I was unwell and in bed at the time. Startled by the engine noise I looked out of the window and saw the plane fly past almost level to crash in the garden of No 5 Tudor Close. There followed black smoke from the explosion and the crackle of exploding ammunition. I hurriedly got up and went to the site but it was cordoned off at the bottom of the cul de sac and sightseers were discouraged. 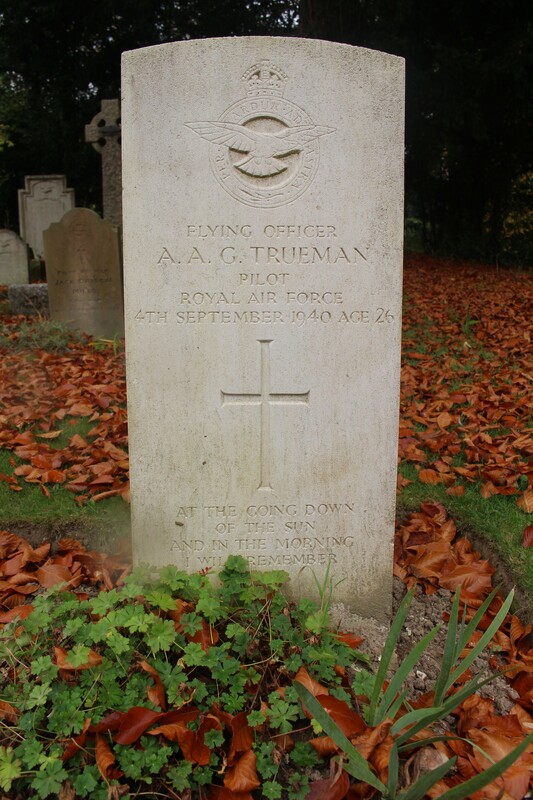 Alec is buried in St. Luke’s Churchyard, Whyteleafe, Surrey and commemorated inside the church on the memorial to the airmen of Kenley. He is also commemorated on a family memorial in Pointe de Bute Cemetery in New Brunswick, Canada. However, his story does not end with his untimely death. 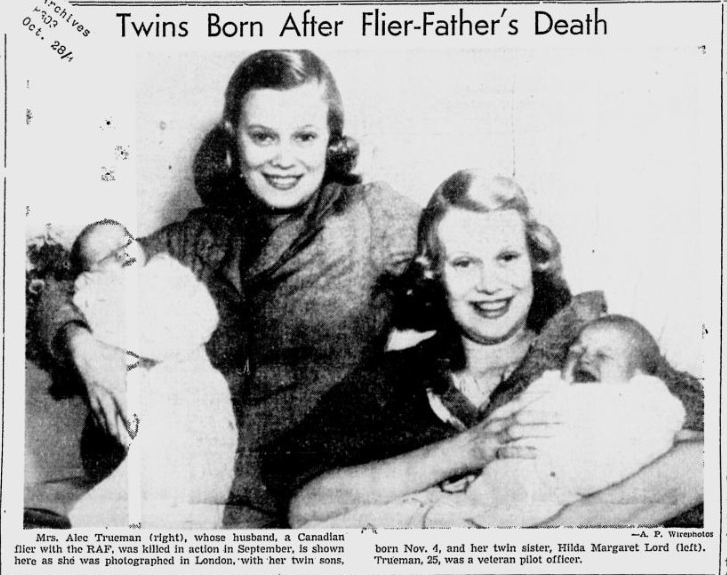 In the final quarter of 1940 Ethel Trueman, Alec’s young wife, registered the births of twin sons, Alec A. G. and Michael G. G. Trueman. In 1940 Ethel Trueman, Alec’s wife registered the births of twin sons, Alec A. G. and Michael G. G. Trueman. Ethel died on 10 June 2002 in Lincoln, aged 89. Alec and Michael both married in Lincoln and are still alive.